When I initially migrated from bottling to kegging, I was glad to be free of bottle wrangling. I didn’t have to keep boxes of empties, deal with cleaning/sanitizing, or the bottle-filling process. I also didn’t have to deal with bottling sugar calculators that had me making bottle bombs with cold-fermented lagers, or ales that sat mysteriously for weeks without developing carbonation of any intensity. But not long after leaving the bottles behind, I ran into the issue of how to share my beers. Of course I could invite people over, but there’s always that party at a friend’s house or a neighbor that really likes NEIPA but can’t make it to your tasting party. To keep your homebrew mobile, you can go the way of glass growlers like the brewery taprooms do. It’s got the same appeal at home as it does at the brewery- cheap and easy. But it limits you on key aspects of freshness and ability to stay cold at a party. If you think about it, it’s akin to taking a 4-pack of your favorite beer you want to share, opening the bottles and pouring it into an empty pop bottle, and screwing the lid on it. Let’s face it, your homebrew is a labor of love, and it’s natural to want to show it off to friends & neighbors. So when you think a bit about the best way to present your baby, it’s not surprising homebrewers look for something beyond the glass growler with screw-on lid. 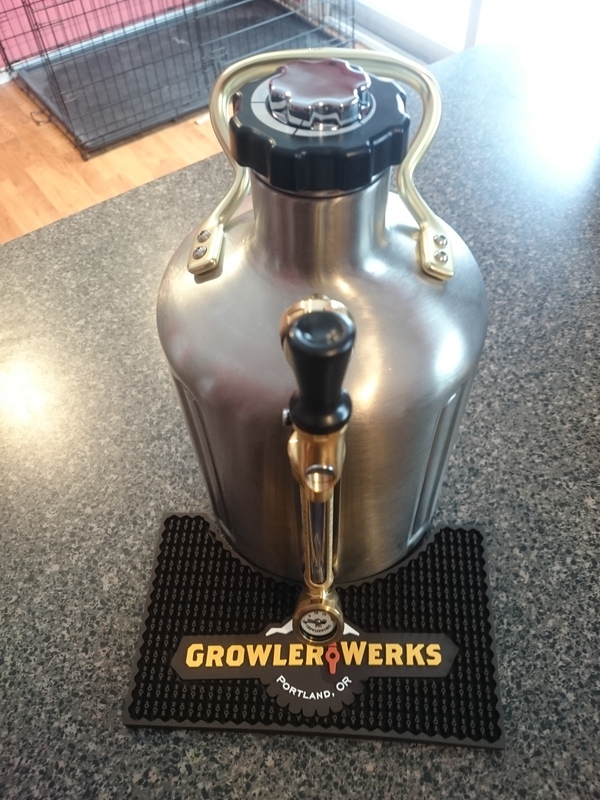 GrowlerWerks came onto the homebrewing scene when it completed its successful Kickstarter campaign in December of 2014. They initially launched with a high-tech upgrade to the standard glass growler with their 64 oz pressurized/insulated growler. The 128 oz version came along about a year later with all the same features, but with a full gallon capacity. That’s a great difference. The uKeg 64 holds four 16-oz pints. That works well for loaning out a sample to a friend. 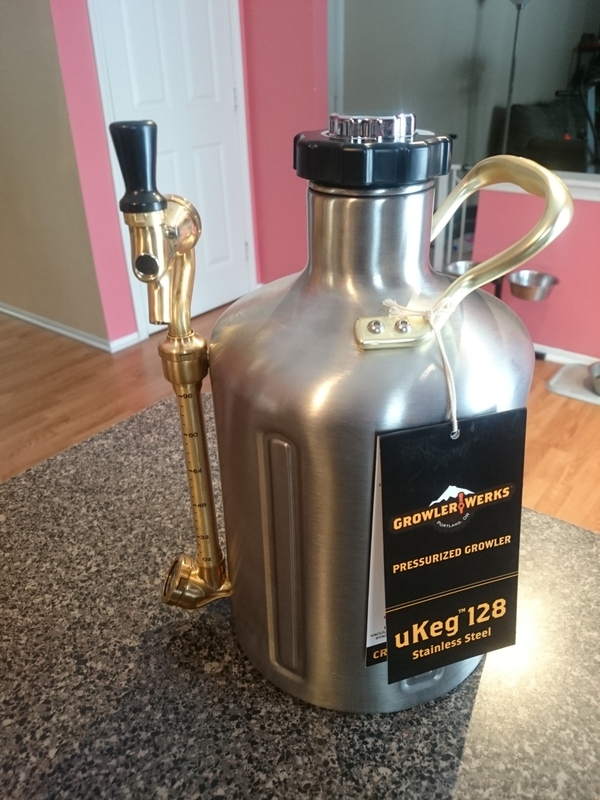 The uKeg 128 holds eight 16-oz pints. Now you’re talking something useful to bring to a party. The 64 almost felt like more trouble than it was worth to take to a party, unless you were bringing more than one brew. But with the 128 you don’t have to show up and then hide it until your craft brew friends find you and get to sample it before it’s gone. There are a lot of features on the uKeg. To start, it’s made of durable stainless steel, with double-wall construction. The double wall means superb cold-holding capability, as air is an awesome thermal insulator. So you can fill it with cold beer, take it to the party, and leave it on the counter. You don’t have to fight over the host’s limited fridge space, or figure out how to cram it in a cooler. The next great feature is its pressurization system. And it is a system. 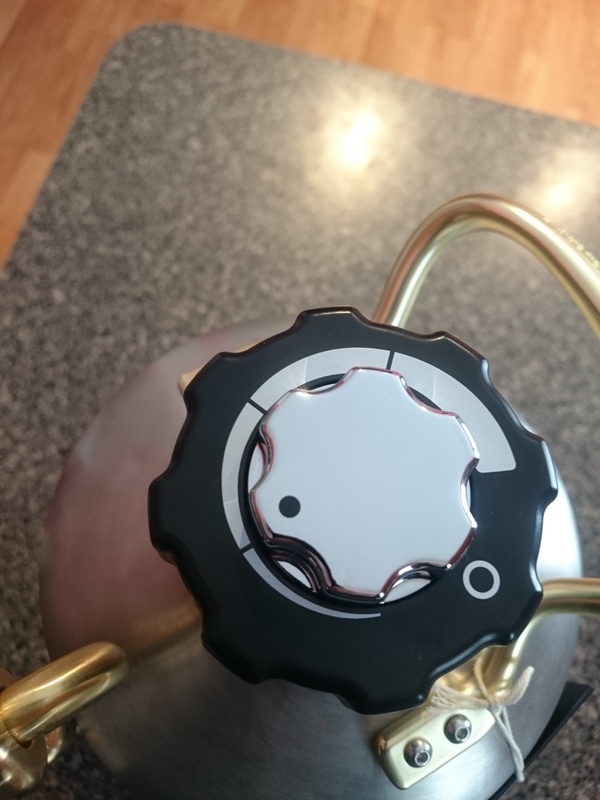 There’s the air-tight lid that’s fitted with an o-ring and screws on. Within that cap is a hidden chamber that holds a 16 gram CO2 cartridge. And the top of the cap has an adjustment knob where you can adjust the amount of CO2 going into your growler (from 0 – 15 psi). The final part of its pressure system is the pressure gauge fitted at the bottom. You can keep an eye on the pressure level and adjust the knob on the cap accordingly. So with this system you can do a purge/evacuate cycle to clear out the oxygen in the headspace after you fill it, and then set it to a serving pressure and go about socializing at the party, knowing your beer will continue to flow without requiring your supervision. 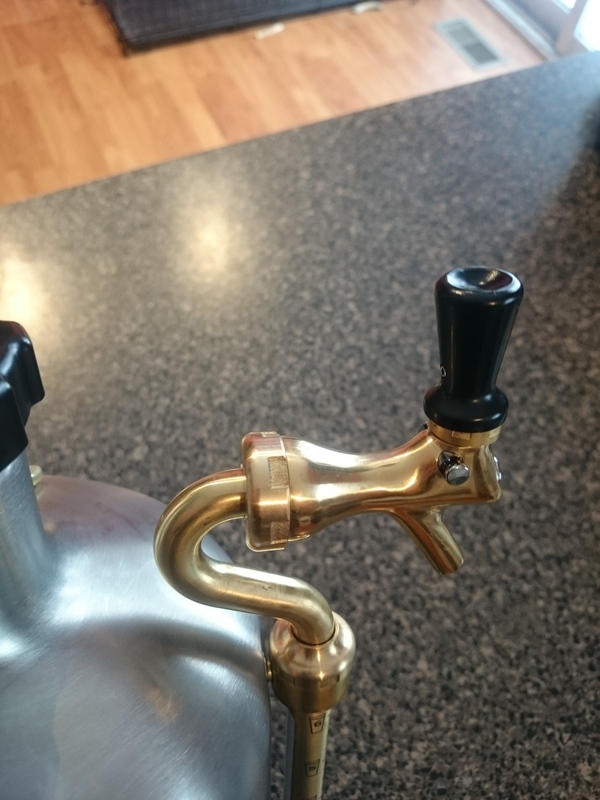 To get the beer out of your insulated, pressurized growler, the tap system has a couple of features to it as well. There’s a standard tap faucet like you’d find on a full-sized kegerator, it’s just shrunk down a bit to right-size it to the growler. The tap is fed through a sight glass feed tube that lets you see how much beer you have left- it even conveniently has volume markings on it. The faucet head swivels out of the way to tuck it in when transporting or storing somewhere. The best feature of the tap system is a little locking slide pin that will lock the tap handle in the off position. The tap handle on these pressurized growlers sticks out like a sore thumb, just begging to get bumped and pour beer all over your floor/car seat/refrigerator. With the locking pin, you just slide it across and don’t have to spend time researching how to get beer smell out of your upholstery. The last feature of the uKeg is its good looks. The colors of the brushed stainless body is contrasted by the plated golden pipeworks and handle. Even the strengthening beads in the wall are both functional and aesthetically pleasing. If stainless isn’t your thing, you can also upgrade to a copper-plated model that’s even more stunning. And if neither of those will do it, for another price bump up, they’ve got a black chrome model. Filling the growler was simple and straightforward. I slipped a length of ½” ID hose over my keezer tap long enough to reach the bottom of the growler. 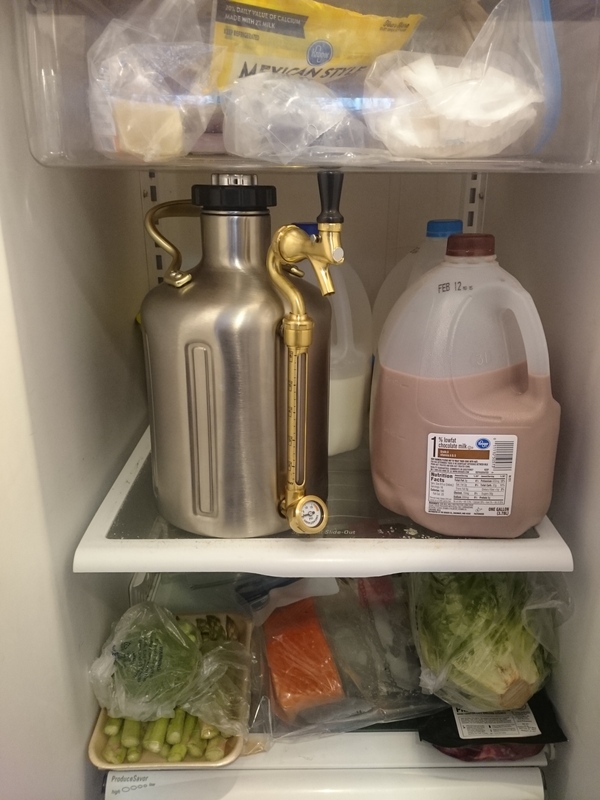 I pre-chilled the growler and hose in the beer fridge in order to minimize foaming when filling. I filled it until a bit of foam flowed up out the top, then pulled the hose out and put the pressurized lid on with its CO2 cartridge loaded. 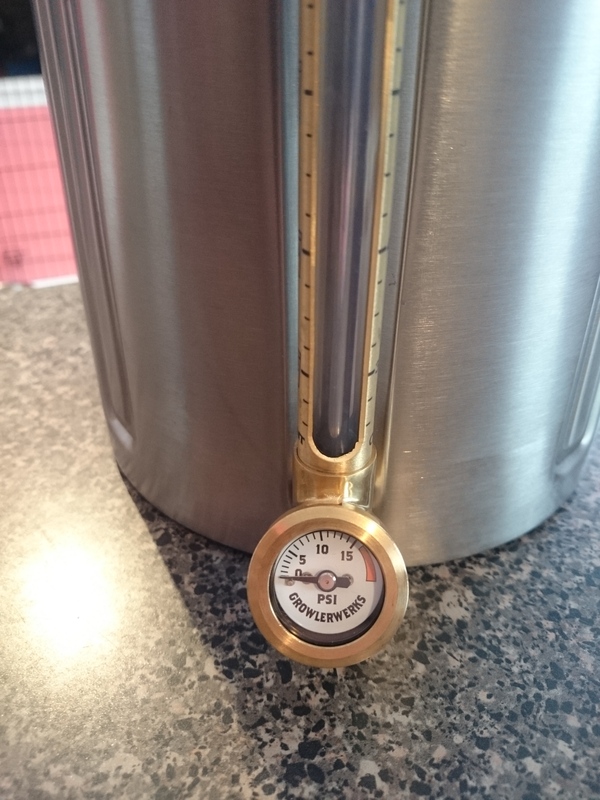 The large pressure knob allowed for easy pressure adjustments. I did one low pressure oxygen purge cycle (but you have to be careful with this so you don’t run out of CO2 in the 16 g cartridge) and I was good to travel. 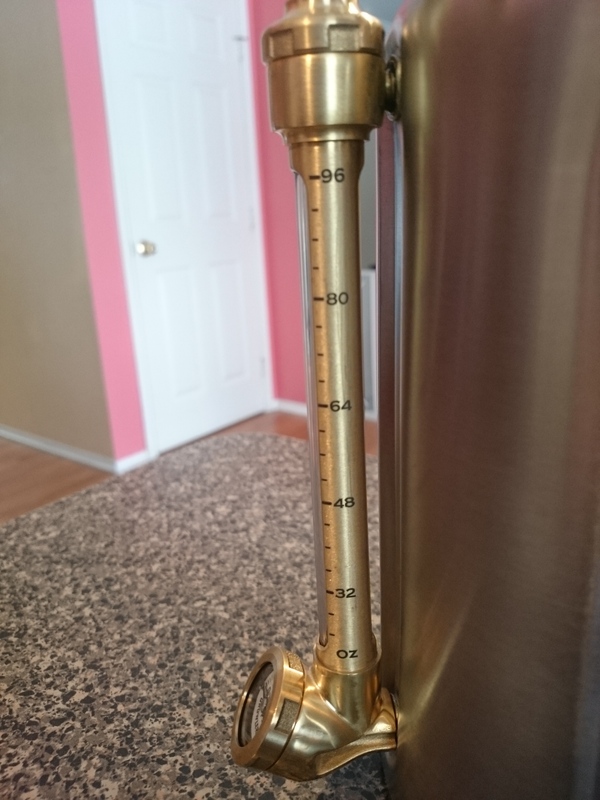 The swiveling tap handle allowed it to be transported easily, and locking pin kept things dry. At the party, the beer dispensed without issues. There were a couple drips post-pour, but not too excessive. GrowlerWerks also sells a custom beer mat to fit around the base of the jug and catch any extra drips. This helps with the professional-looking presentation. The beer flowed smooth, without issues, all the way to the last pint. No crazy foaming or CO2 problems of any kind- which is usually the challenge of mobile keg beer. Everyone was impressed with the look of it, and it made for a good presentation of my hard labors! 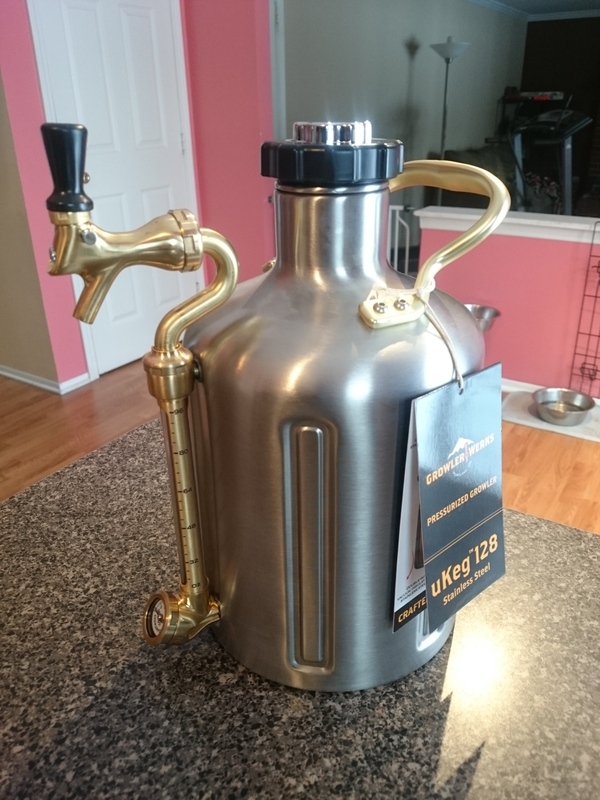 Special Thanks to GrowlerWerks for providing the unit used for evaluation in this review. This entry was posted in Amazon, Draft, Featured Reviews, Growlers, ig, Portable Serving, Reviews, Reviews & Top Posts on March 31, 2018 by admin. I was hoping for information on what is involved in cleaning the unit. Cleaning is pretty simple. GrowlerWerks sells cleaning tablets, or they tell you that you can use water and Baking Soda, or I just used my standard One Step cleaner. Rinsed it out first, then put in cleaner and shook it up. 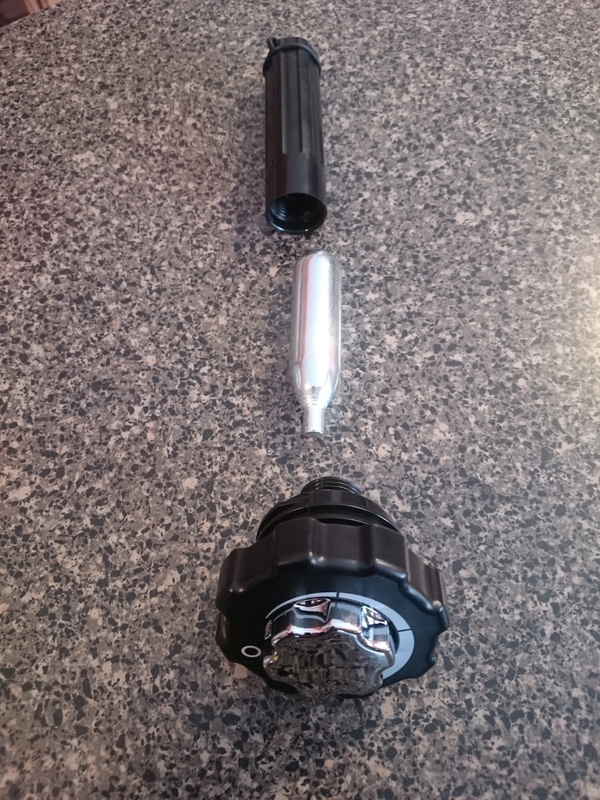 Then the CO2 cartridge is sized such that there’s enough spare gas left after dispensing that you can pressurize your cleaning fluid and then open up the tap and run it through. So it only took a few minutes, and didn’t require a brush or anything fancy.